Is there anything better than a warm blanket and a hot bowl of soup on a cold winter day? We have had a very mild winter here so far, but if you're in the Midwest, you know that's all coming to an end this weekend. The snow is kicking up and we're in the line of the arctic blast that's making the news, so my only plan for this weekend is a cozy couch, my blanket, and hot soup. If you're in the storm's path and are staying in too, I've got a recipe that's comforting, yet light (cause we're still doing the healthy eating thing, right?) and so perfect for taking the chill out of your bones. 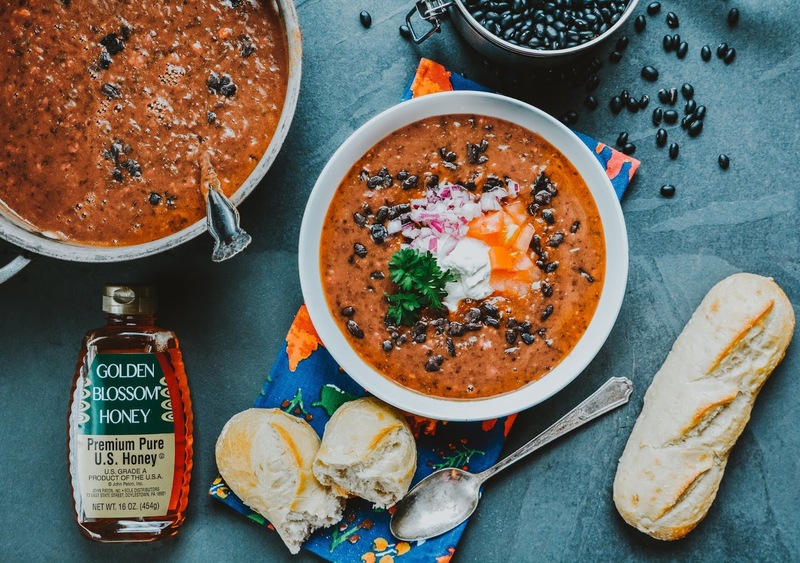 This Black Bean Soup from Golden Blossom Honey is great for lunch or add in a salad and a hunk of crusty bread for a light dinner. Black bean soup is filled with a lot of nutritional veggies that pack a huge flavor punch, but also makes it a guilt-free meal. Jason doesn't get excited for soup, but when I made it earlier this week, he made a point of commenting on how good it was. If you're really trying to keep the calories down, swap out the sour cream for plain yogurt. That's my hubs favorite way of getting the tangy zip without consuming fattening sour cream. Additionally, you can pressure cook dried beans in 30 minutes instead of using canned beans for this recipe. Even if you don't make it this weekend, tuck the recipe in a safe spot and use it as part of your Cinco de Mayo celebrations. Yes, I know there's still 4 more months until that day of goodness, but you can never be too prepared for planning out an epic fiesta menu, now can you? Have you had any snow in your area this winter yet? Hi, Theresa! Qw've had snow, and we're expecting snow tomorrow afternoon. This recipe sounds delicious and healthy. Take care. Tres lovely photos, dahlink. We do love beans even if it makes us do the poopsies more often than usual. Hope you won't freeze this weekend. Ours will be mild, the snow has melted and now it is that fugliness that the snow left behind - rotten leaves, garbage, mud etc. It's raining here today so I made myself brown rice with dry peas and garlic for lunch. I used to not like cumin either, but it's really grown on me. I especially love it in tacos. Actually, I'll sprinkle a little in most of my Mexican dishes. You can leave it out of this soup. The small amount it calls for won't make or break this recipe. I hate that ugly slush the snow leaves behind, making the world look all dreary and dirty. It's so depressing. But, your rice and peas sound like a good comfort food for such a crummy day. Sure sounds like a healthy one indeed. As for the snow, keep it all there so we don't get it on Sunday, please! Let's hope that snow just bypasses us both. I wish spring would hurry up and roll around! Beans are so healthy. I love to cook with them because of that and their wonderful flavor. I've never made a soup totally devoted to them, though. So healthy and full of fiber. It's such a good for you soup all the way around! I can't wait to make this! Since we moved to the southwest several years ago, I've become a big fan of beans. This looks delicious! Can't wait to make it. Thanks for sharing! It's snowing now. This looks good! I love soup this time of year. We made chili last week. Then Travis made lentil soup earlier this week. I wanted to take 1/2 that soup over to my friend's house. His partner's Mom just passed away. They've been really busy with family, so I stuck it in my deep freezer. I'll take it over when the time is good. This would be the perfect meal served up next to some snow! Sadly, in CA we don't get snow where I live; stay warm this season! 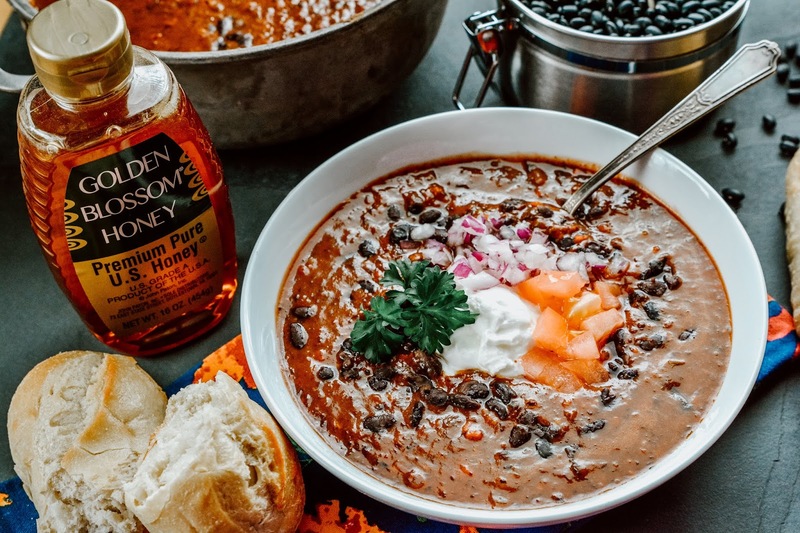 Black bean soup would be IDEAL for today, because we are expecting a major snowstorm in Cleveland and this would be yummy to eat watching a movie! I'll definitely save this recipe to make soon! I love black beans so this sounds good to me. We don't get snow here usually but it would be nice if we did. I love soups this time of year. With the crazy weather we're having, this would be perfect. With all those spices and ingredients, this must be delicious! I'd love to try it at home... we all love black beans. I just made this the other night. I used the leftovers to make a santa fe chicken dish that baked in the oven. It was perfection. Black Bean Soup is one of my favorite comfort foods! I love it during cold weather. I hope I can cook this later tonight. So yummy! Black beans are always a fave for me, and they are extra delicious in soup! Oh this bowl of soup looks delicious. However, I am the only one in my family that loves beans. That is perfectly fine. I can have all the beans I want without having to share it with them. Haha. Thanks for the recipe. I will make this soon. Because I am pecatarian I have to eat more black beans for protein. I will keep this recipe in mind to make this soup soon. Hi, Theresa! Just so you know, I was born Canadian, and I write a lot about Canada and Canadian things, but I actually live in Aurora, Colorado. We had another snowstorm last night, and we were in almost blizzard conditions through about 11:00 a.m. this morning. It's still very cold and windy tonight. So today was the perfect chance to make this recipe. I stocked up on the ingredients yesterday, because I knew I'd be snowed in today. The bean soup was delicious! My husband Terry and I really enjoyed its flavor and appreciated that it was healthy. We're going to have it again the day after tomorrow. The recipe made a huge pot, so I'm freezing the leftover soup to see how it tastes after being frozen. I think overall, we'll get eight or nine filling servings out of the batch. This soup may become a winter staple! Thanks for sharing it! This bean soup looks like it would be so amazing. I have not had a really good one in a long time!